FOR SERIOUS ATHLETES The most advanced kinesiology tape, made from 100% synthetic fabric to last far longer than other brands. Lightweight, latex free, comfortable, provides both support & mobility, and includes safety reflective print & carry case. STRONG ADHESIVE Latest technology that sticks for days with effective skin preparation. Our synthetic, moisture-wicking, breathable fabric provides maximum water, sweat, and humidity resistance. And the precut rounded corners help avoid frays. EASY TO USE Ready-to-use precut strips are perfect for tape applications. No need for messy cutting with long, uncut rolls of tape. Easy to self-apply using our free instruction videos for dozens of common injury areas. Contact us with questions. HOW IT WORKS KT Tape helps reduce tissue pressure and provide muscle support, helping you recover faster from pain. Just ask one of our Pro or Olympic athletes who rely on KT Tape when pain is present and when championships are on the line. 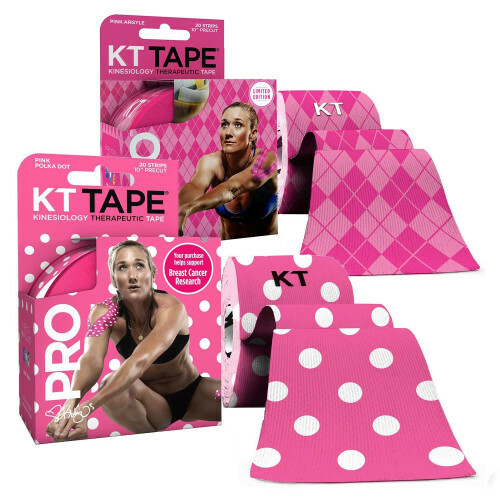 KT TAPE PRO is the latest breakthrough in light elastic taping. The synthetic fibers are performance engineered with a larger elastic core. KT TAPE PRO lasts longer and works harder to keep you in the game. 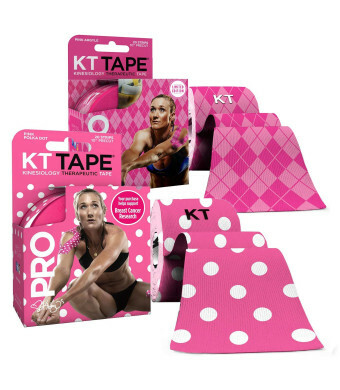 KT TAPE PRO features a stronger adhesive, quicker drying fibers, and a reflective pattern for increased safety when running or biking in low light conditions. KT (Kinesiology Therapeutic) Tape is a strong, elastic athletic tape that reduces muscle pain. KT Tape provides relief and support for muscles and joints and can be used to treat hundreds of sports injuries. Kinesiology tape, treatments, and application techniques have been used by healthcare professionals such as orthopedics, chiropractors, physical therapists and athletic trainers for over thirty years. KT Tape is the first brand of kinesiology tape ever to be offered directly to consumers and is widely adopted by healthcare professionals and sports teams.